The violin bow is an amazing contraption. Pick one bow up after another, and they pretty much look the same, but they may feel light or heavy, even though the difference in weight could be a tenth of an ounce (3 grams). More astonishingly, when you try playing with various bows you’ll find some that actually sound a lot better than others. I remember making a number of drawings of violins and bows many years ago. Bows are very difficult and frustrating to draw because they so long, thin, and seem almost uniform in shape. The stick has a subtle arc to it, called the camber, which can be beautiful but tricky to draw, as it gently curves toward and away from the hairs. It’s a bit more interesting to draw the gracefully shaped tip, and the black curved block of ebony at the frog. 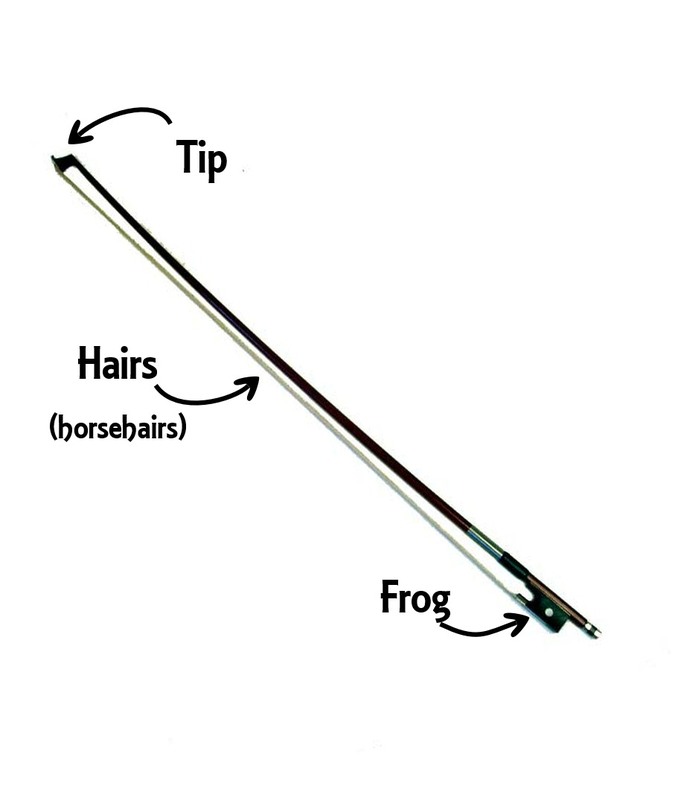 (”Frog” is horse terminology — the bow hairs come from a horse’s tail, and the frog is named after the part of the horse’s hoof that’s in the middle of the horseshoe). When you try playing with different bows, you find differences in responsiveness partly because of the type of wood and the quality of the carving, which affect the strength and springiness of the bow stick. A very weak stick could easily touch the strings with some pressure, and if the hairs are tightened too much, the stick might even arc the wrong way (away from the bow hairs). The camber of the bow, the way the stick curves toward the hairs, allows you to control the tension of the hairs against the strings. I always recommend tightening the bow until, at the place where the stick and the hairs are closest, the gap between stick and hairs is about the thickness of the stick, or a little wider. It’s essential to loosen the bow tension when not playing. 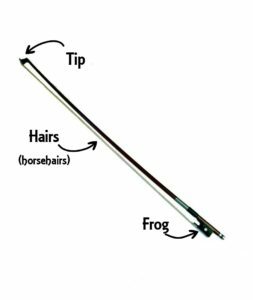 If the bow is too tight for too long, the hairs can stretch so that you need to tighten them even more, sometimes even to the limit of the bow (there’s a little slot on the stick under the frog that limits how far the bow screw can go). The constant pressure on the stick can even cause the camber to lose its arc, making the bow less responsive to pressure and affecting your sound. I once had to have my bow re-cambered, which involves steaming and bending it. Notice I said “once” — this is rare and may never have to be done to your bow. Two factors that have a big impact on the playability and sound quality of a bow are not even visible. One is the evenness of the wood carving. If the bow stick is not perfectly carved, one spot might be unintentionally thicker than a nearby spot; this slight unevenness translates directly into the sound produced under those spots when playing on the strings. The slight change in wood thickness could slightly affect the pressure and the continuity of your sound. The momentum and continuity of your bow stroke coaxes the vibrations out of the strings, and the slightest change can disrupt the vibration, making the sound less resonant, or simply changing the sound quality in a way you didn’t intend. These changes can be so minute that you might simply feel the sound of one bow isn’t as nice or as easy to produce as another bow, without your being able to diagnose why. And of course, you don’t have to. You just have to tune in your ears to the sound of each bow, and notice how the bow feels in your hand as you play in all parts of the bow and at different speeds. The other invisible factor in addition to the wood carving is the balance (although it too is affected by the carving). The frog is the heaviest part of the bow; the tip is the lightest. When the bow rests on the strings at the frog, the frog, your hand and the rest of the bow all lend weight to the bow. At the tip, there is nothing adding weight other than the tip itself, which is so light that if you looked inside the tip (possible only while the bow is being rehaired), you would see a triangular hollow so thin that it is translucent in places. All sound at the tip is dependent on the pressure your finger applies to the frog while you’re playing. (Try the “triangle” exercise in Technique Video Group #1, third video, for a practical exploration of this.) Each bow has its own balance, based on the weight of the frog and the distribution of the thickness of the stick (again a factor of the wood carving). I strongly encourage you to try out bows, just for the sake of tuning your ears and bow hand into the possibilities offered by different bows, whether or not you’re in the market for a new bow. French-style bows tend to have springier, responsive sticks; German-style bows tend to be stiffer and more robust. Carbon fiber bows tend to be lighter and yet produce the sound equivalent to a more expensive wooden bow. Fiberglass bows are heavier and clunkier (and lots cheaper) but worth trying just for comparison. Be sure to try a range of bows, from too cheap to too expensive. Go to a shop that allows you to spend some time trying out a range of bows, or have some bows shipped to you (Shar Music, for example, does this) so that you can play with them at home for a few days. This helps you try the bows repeatedly and in a comfortable place; it also helps get you away from the bow you’re used to for a little while, so you can get a more accurate feel for the differences. You might not want a new bow but the comparisons can improve your awareness of sound. You might gain a new appreciation of your own bow. Or you might realize that you are an amazing player being held back only by a bad bow! Of course none of this matters without the rosin on the bow hairs. If you’ve ever tried playing on brand new bow hairs, you know that without rosin, they produce about as much sound as playing on the wooden stick! There are all sorts of opinions about rosin, about the structure of bow hairs, and so on. I must confess I’ve come across so many contradictory opinions (all of them very self-assured, of course!) that I am not convinced there are significant differences in types of rosin. They are almost a magic charm (and might work for you!) — some people swear by the green ones or the ones with gold dust (literally! ), or the light or the dark. They say the bow hairs no longer take rosin after a certain amount of playing. Being natural structures, I’m sure there is something to this, but I haven’t done the scientific research. I’d just recommend you rehair your bow periodically, certainly once every year or two, and more often if the hairs get dirty in the playing area (not necessarily just by the frog) or if you grab the bow too often with your hand and create a slick spot (finger oils and rosin do not mix). Of course, if your bow is worth less than $70, you may as well buy a new bow, because that’s the cost of rehairing. The bow is our musical voice, providing every ounce of sound we make, lending power and pulse to our music, and transferring our emotions into all the music we play. The bow is often totally ignored in written music and therefore in much of our conscious thinking, and yet it is the most important part of playing the fiddle. Get to know it better, whenever you can! thank you for the bowing tips. A helpful article. Been using my bow for 3or4 years without changing hairs. I inherited it and have always used Pirastro rosin. Are there diff quality hairs? My friend and I took each other’s coda bows by mistake and rosined them with diff rosins for about three months before we realized we had the wrong bows. Also I haven’t changed strings until they pop. Only popped one in three years. Won heicore strings at Fiddle Hell and inherited Pirastro and Evan Pizarro. Which do you think are best?